The average weight of ham is 9 lbs. 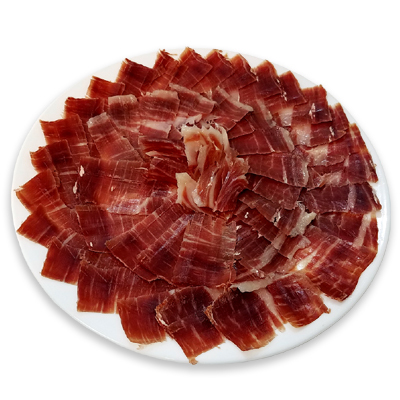 Pure Iberico Ham de Bellota Blázquez Boneless is an exquisite product made from the hind limb of the Iberian pig bred in the dehesa pastures of the Iberian Peninsula and acorn-fed exclusively during the period of mountaineering. This is a handmade product with a quality capable of doing the delights of the most demanding gourmets. Throughout almost 90-year of the Blázquez brand history, over four passionately devoted generations, our company and the Blázquez family name have created a gastronomic masterpiece evoking quality, confidence and a committed attention to the most demanding details. Each pure Iberico ham de bellota Blázquez Boneless preserves its own personality throughout the demanding, carefully monitored process of individually supervised preparation and curing. Blázquez’s methods upholds maximum quality through each phase of the product cycle guaranteeing that each mouthful offers the palate an authentic, unique experience in its aspect, texture, aroma, flavor and composition of lipids. The Iberico Ham de Bellota Boneless is the most used for exporting from Spain, mainly due to the ease it provides for its cutting by machine. 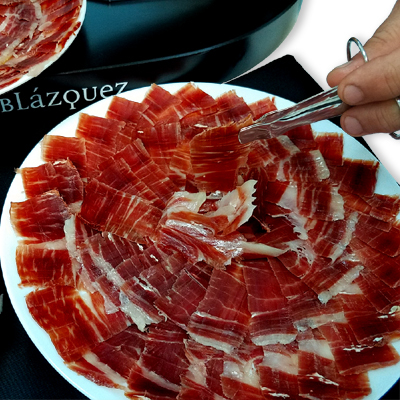 This Iberico Ham de Bellota Blázquez Boneless is prepared in the same way that the Iberico ham de Bellota of this brand but at the end of the ripening process and before packaging it is taken off the bone. 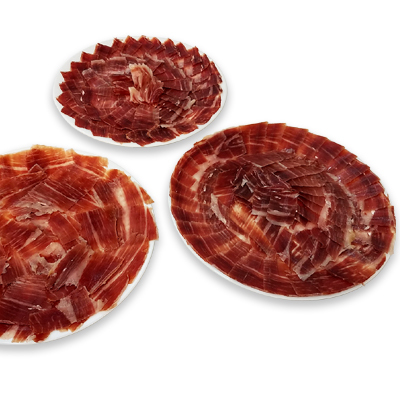 Cut only the slices of the Iberico Ham de Bellota Blázquez Boneless to consume. When starting to cut the Iberico Ham de Bellota Blázquez Boneless, you should have taken out the piece of your package. 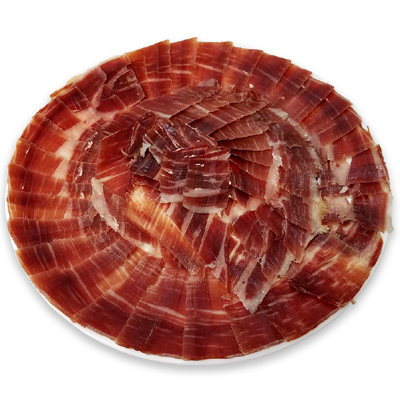 Therefore, each time you finish cutting process, the uncovered side of the Iberico Ham de Bellota Blázquez Boneless is covered with a slice of the same ham or a piece of bacon, you can also add a layer of olive oil to avoid dryness, cover with a porous towel thus it does not create mold. Maintain always between 2 and 10 degrees Celsius. 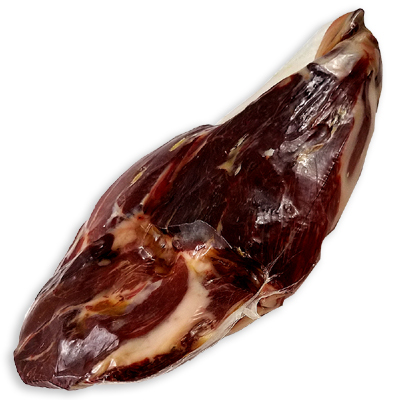 The Iberico Ham de Bellota Blázquez Boneless should not be eaten cold because it may lose aroma and flavor. It is very important to cut the Iberico Ham de Bellota Blázquez Boneless in very thin slices, almost transparent, however, if you don’t have prepared a proper knife to cut the Iberico Ham de Bellota Blázquez Boneless, you cannot do it correctly (it must be a long knife, fine and very sharp), you can also use a slicer machine. It is so important to know how to cut well the Iberico Ham de Bellota Blázquez Boneless that there is a great difference when you taste it when is cut correctly than otherwise. When using a machine, you should take some steps: if Iberico Ham de Bellota Blázquez Boneless is not already peeled and trimmed, do it as a previous step to its mechanical cutting. The degreased should be superficial so that there is always enough layer of fat for avoiding the lean is unprotected. Before putting the Iberico Ham de Bellota Blázquez Boneless in the cutting machine, divide the piece. The cutting can be done in two ways: Longitudinally, from the knuckle to the tip or vice versa, and transversely from the hub to the tip. 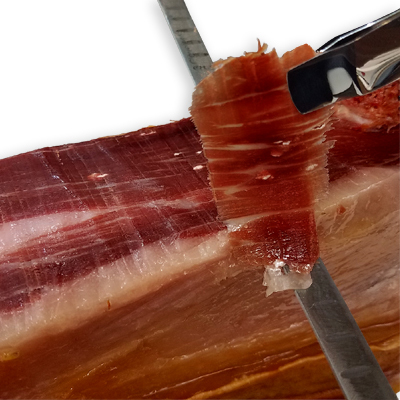 Before placing the Iberico Ham de Bellota Blázquez Boneless in the cutting machine proceed to adjust the blade. Cut the ham ensuring that the resulting slices are very thin. 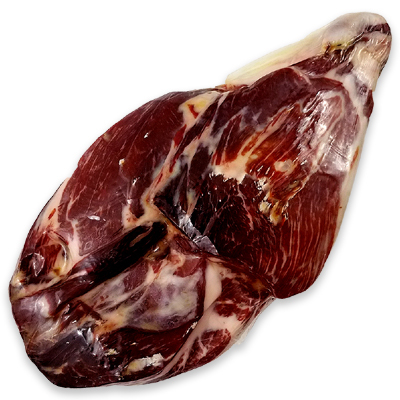 Why selecting a Pure Iberico Ham de Bellota Blázquez Boneless? This product, the Pure Iberico Ham de Bellota Blázquez Boneless belongs to the highest food categories, it is ideal for a healthy and balanced nutrition due to its large nutritional properties such as proteins, vitamins like B1 , B6 , B12 and folic acid which are very beneficial for the nervous system and brain function. Also Pure Iberico Ham de Bellota Blázquez Boneless is rich in vitamin E, which is a powerful antioxidant, also has minerals such as copper, essential for bone and cartilage, calcium, iron, zinc, magnesium, phosphorus and selenium, the last very linked to delay aging processes. Some of the main features of this Iberico Ham de Bellota Blázquez Boneless is that the fat of the Iberian pigs, fed mostly on acorns, has a high content of monounsaturated oleic acid, about 50 %. This type of fat, as has been shown in scientific studies, produces a favorable effect on cholesterol in the blood by increasing the rate of good cholesterol (HDL) and reducing the rate of bad cholesterol (LDL). 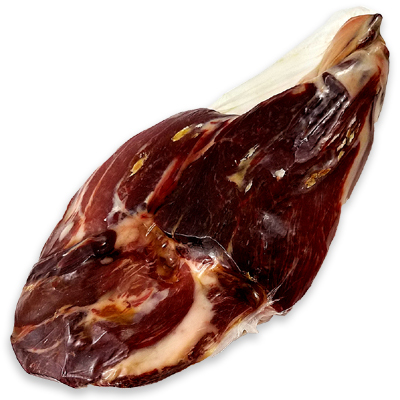 Only virgin olive oil has oleic acid content higher than the Iberico Ham de Bellota Blázquez Boneless. By having a total proportion of unsaturated fatty acids of about 70 %, this product is "heart healthy" because the fat it contains is the healthiest of all the well-known animal fats and even healthier than some of vegetable origin oils. The merit is not only because of the breed of pig, also has a great influence the feeding on acorns and grass that are mainly the foods provided to pigs in free regime breeding, from which is obtained the Pure Iberico Ham de Bellota Blázquez Boneless. 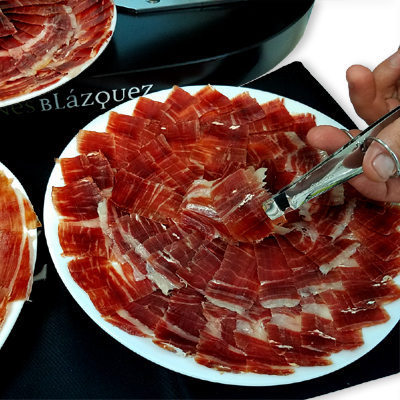 100 grams of Iberico Ham de Bellota Blázquez Boneless, provides the body with something less than 250 kcal, so that a moderate consumption will not harm low-calorie diets. 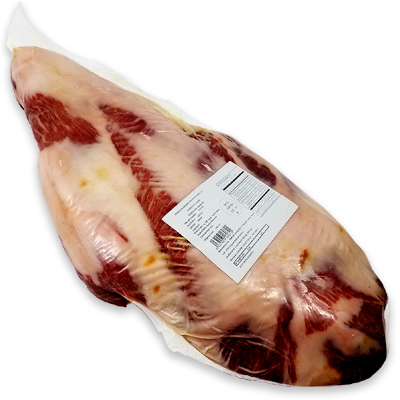 As 100 grams of Iberico Ham de Bellota Blázquez Boneless contain 43 grams of proteins, the Iberico Ham de Bellota Blázquez Boneless is also a substitute for red meat. The designation Iberico Ham de Bellota has also received recognition from the European Union and Traditional Specialty Guaranteed (TSG) and entered in the Register maintained by that name by Regulation 2419/1999. This product has been recognized as the first Traditional Specialty Guaranteed of the Spanish food industry. This traditional Spanish dish, so special is considered a product of the highest quality food. The company “Jamones Blázquez” is a unique project founded in 1932. With a long tradition of knowledge that has been transferred from generation to generation and has managed to become the first farm of breeding of the pure black Iberian pig, where these animals find food that helps them to achieve the quality of their products. BLÁZQUEZ brand with a tradition of more than half a century exporting its products to many countries, prevail the quality of their products and style of work that has provided it countless awards, as well as the award for “Superior Award Taste Maximum Coalification by the International Taste and Quality Institute of Brussels for 6 years in a row”.